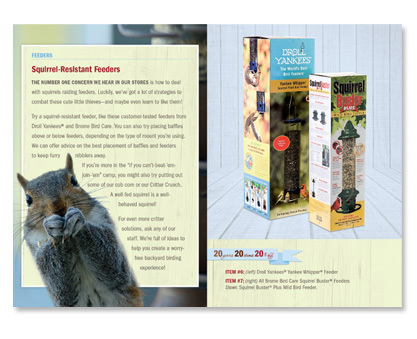 For the last several months, we’ve been working with our client, All Seasons Wild Bird Store, to unify their brand and present a strong brand image and messaging. This weekend, a lot of those new changes will become apparent as All Seasons celebrates its 20th Anniversary by kicking off a 20th Anniversary Sale. 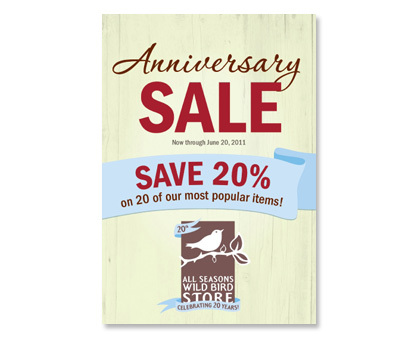 All Seasons Wild Bird Store is locally owned by a father and son team. They have five locations throughout the Twin Cities and an online shopping cart. 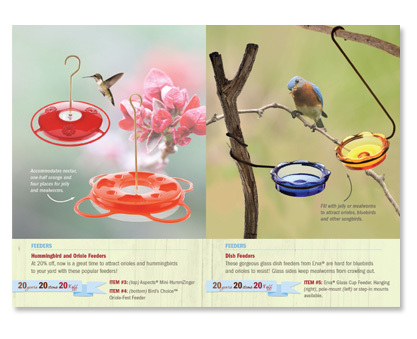 Their tagline is “Your local backyard birding experts,” and for good reason—store employees are knowledgeable in the best ways to attract the birds their customers want, and discourage the pests they don’t. 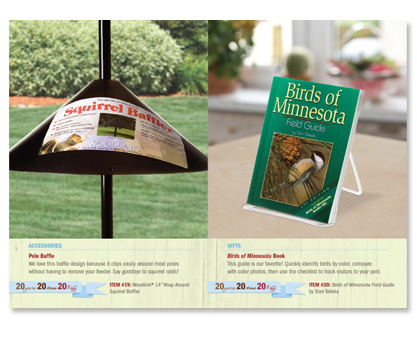 You can find All Seasons Wild Bird Store on the web by visiting their website, or their Facebook page. 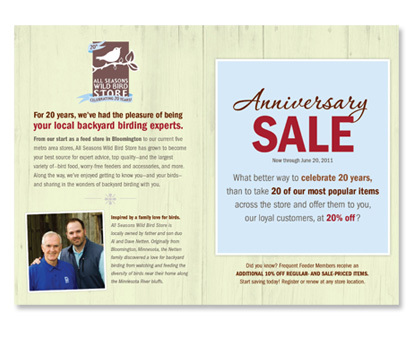 In addition to in-store graphics in conjunction with the sale, Mix Creative wrote and designed a 24-page mailer that showcases the sale products. The theme of the sale, “20 years, 20 items, 20% off” is reinforced throughout the book. The book features a new, Anniversary brand mark, that will be used throughout the coming year. 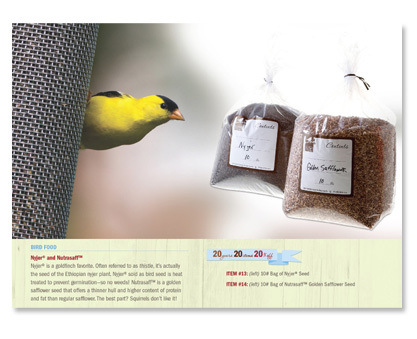 Our goal was to showcase the products in a way that reinforces the theme of backyard birding. The following examples show the Anniversary brand mark and several sample pages from the mailer. Printed on FSC 80# Flo Matte Cover. This entry was posted on Thursday, June 9th, 2011 at 2:15 pm and is filed under Uncategorized. You can follow any responses to this entry through the RSS 2.0 feed. You can leave a response, or trackback from your own site.